You guys. This book. My heart. I just... This is one not to miss if you've got kids asking questions about social justice or things they've heard (or seen or experiences) about police violence. It's incredibly tough and beautiful, and it would make an excellent conversation starter. 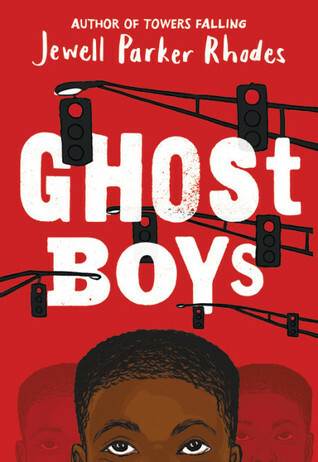 Ghost Boys by Jewell Parker Rhodes is narrated by Jerome. Jerome wasn't doing anything. With a toy guy his friend had given him. Now Jerome's stuck as a ghost. He desperately wants to move on; he doesn't want to see his family in pain. He doesn't want to see them moving on and living their lives without him. But Jerome, and all the ghosts of boys killed due to racial injustice, can't move on. The first ghost that Jerome gets to know a bit is the ghost of Emmett Till who was killed in 1955. That's a lot of years for ghost boys to be waiting for change, for the world to get better so that there stop being more ghost boys. This book absolutely broke my heart. It's a hard read. And it says such important things. It starts a conversation essential to have with middle schoolers. The only character in the book who can see Jerome as a ghost is Sarah, the 12-year-old daughter of the police officer who killed Jerome. Not only does this show essential similarities between the two children - they're the same age, they're the same height even though Officer Moore describes Jerome as being massive and threatening - but it humanizes Officer Moore. He's a person. He made a terrible decision. He has a family. His daughter cares what happens to him. As Sarah learns more about the trial and hears corrections from Jerome about what went down that day, she has to figure out how she feels about her father and what she's going to do with those feelings. Middle school kids who aren't ready for books like The Hate U Give or How It Went Down need this book. This is an essential purchase for library shelves. It deserves to be read widely and taught and discussed. Readers looking for more moving stories of atrocities against people might try How I Became a Ghost by Tim Tingle, narrated by a Choctaw boy who does not survive the Trail of Tears.